I love the smell and flavor of ROSE! I believe it’s a way to add beauty to my life every day. Don’t make Valentine’s Day the only reason for roses. Long-stemmed roses that have been sprayed and available everywhere wouldn’t be my choice for a gift. I think a mini rose plant or rose scented body products are nice. I love to enjoy a gift longer than a week. Do you like to make your own body products? I make my own rose toner with Cortas Rosewater with a few strands of saffron in a cobalt glass spray bottle. Super affordable and refreshing for the skin! 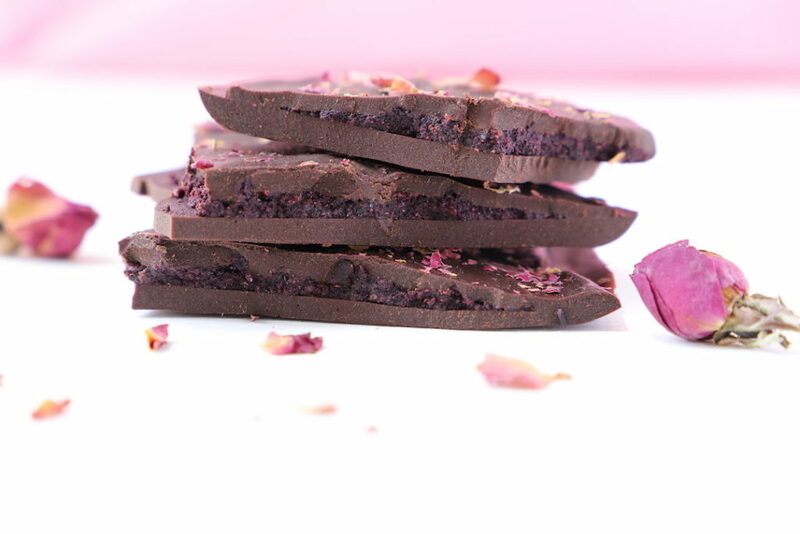 I really love rose flavored chocolate. Sweet floral decadence! 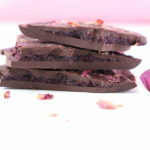 I’ve made rose petal chocolate before but I wanted to add a creamy center. My fruit, flower, and veggie powders came out to play! 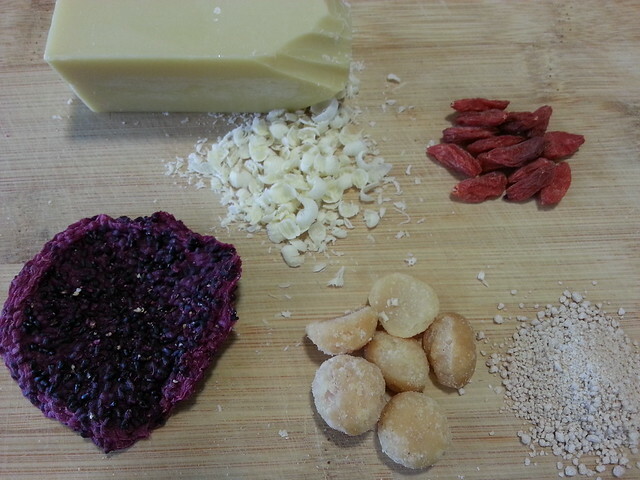 I made a coconut butter mixture with the powders of maqui berry, beet, and rose. You could also use other magenta powders like pomegranate, pitaya, acai etc. I powdered the rose petals in a clean coffee mill I use as a spice grinder. 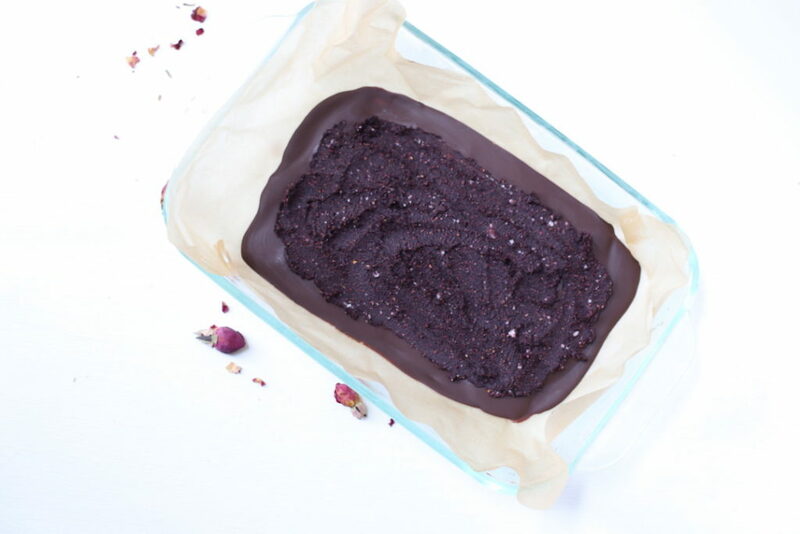 Anyone who loves a sweet, floral flavor will find this chocolate so soothing. Rose Essential oil is something you can continue to use in your own body care products. If you are Pitta dosha, need to foster self-love, or know anyone who needs heart-opening, some rose can help! 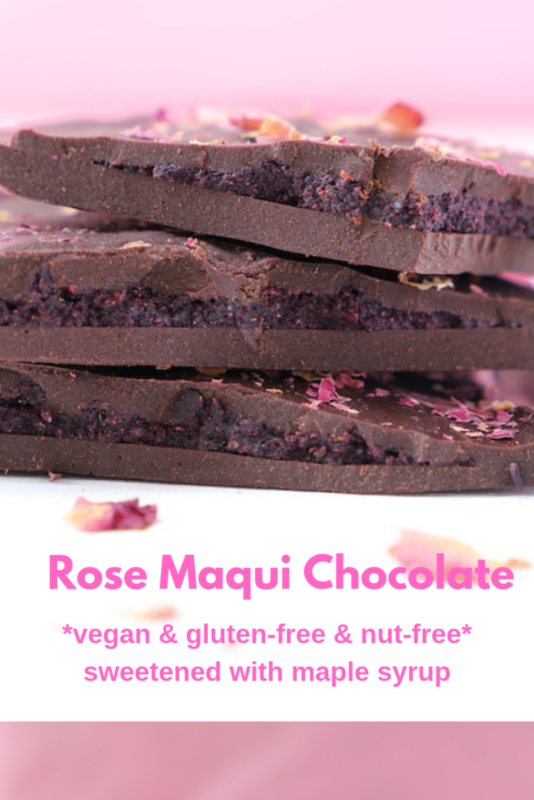 Vegan Rose Maqui Chocolate made with the best quality ingredients! No refined sugar, dairy and is gluten-free. 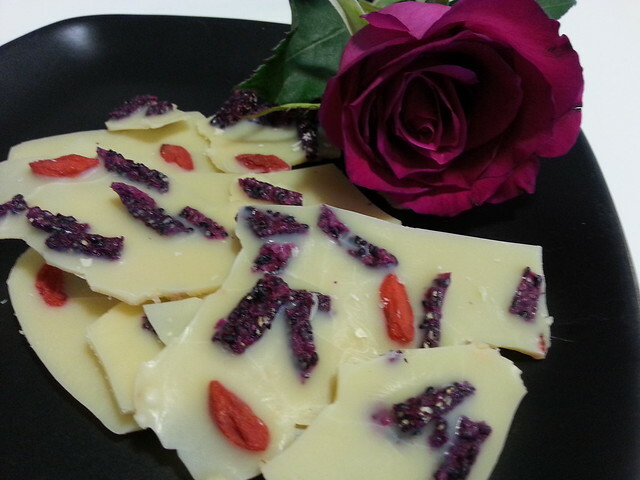 Flavored with superfoods and pure organic roses and rose otto essential oil. Measure the filling ingredients into a small bowl that can hold 2 cups. Pack coconut butter into a 1/4 cup. Add to the bowl along with all the powders. Use a small spatula/scraper to mix this well. Add the maple syrup and the 1 drop of rose oil. Mix thoroughly until a thick, smooth paste forms. Place a small saucepan on low and heat up the cocoa butter, about 3-4 minutes. Remove from heat and add the remaining ingredients for the chocolate. 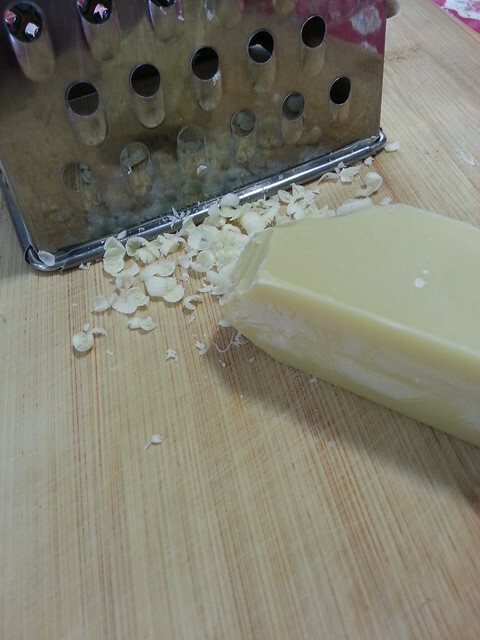 Use a spatula to mix and scrape down the sides. Take a small baking sheet pan or Pyrex dish and line with parchment paper. It shouldn’t be bigger than 8 X 8 inches or equivalent. Larger pans will make very thin bars, a smaller container will make a thicker bar. Pour half of the chocolate into a uniform layer, using a spatula to make smooth. Place in the fridge or freezer until this layer is hard. Once hard, use a smooth spatula to spread the maqui rose filling in the center of the chocolate leaving a 1/2 border of chocolate. Make it a smooth layer. Pour the remaining chocolate on top and use the spatula to smooth. Coconut Butter – You can make your own by using a food processor to break down dried coconut strips. 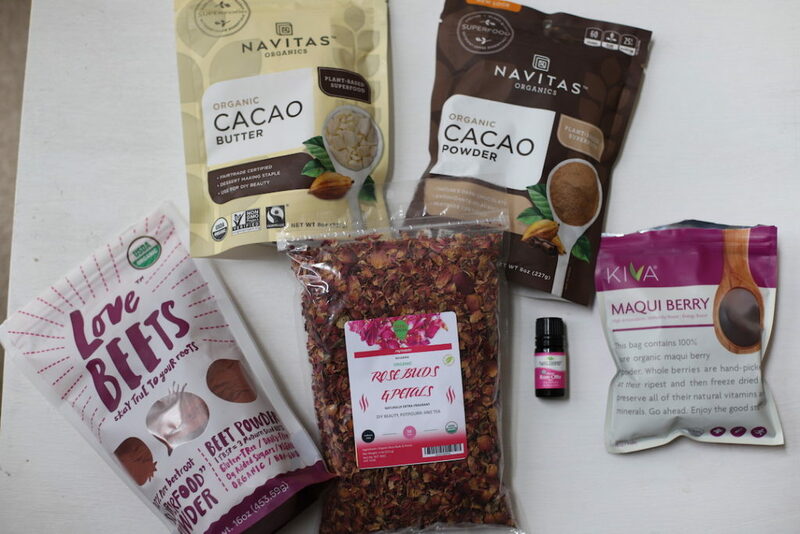 Maqui Powder – You can also try acai powder, pitaya powder, pomegranate powder, raspberry powder! 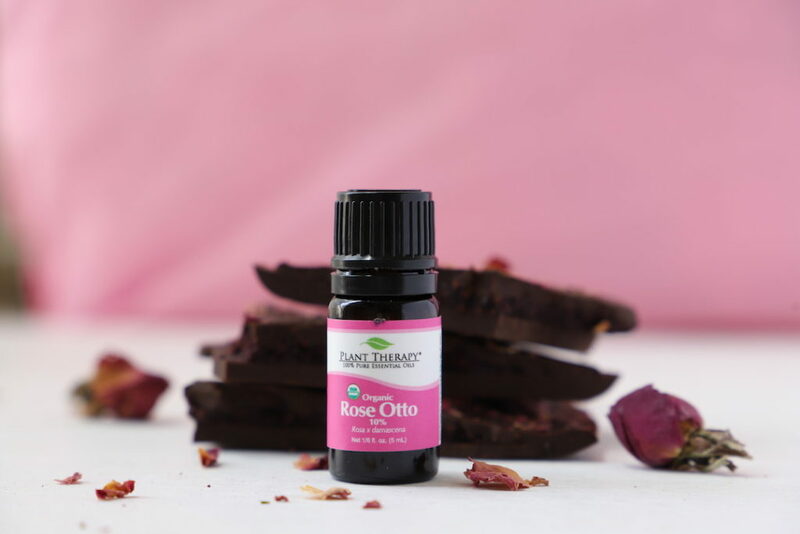 Rose Essential Oil – Get organic! Use only 1 drop if you want a more subtle rose flavor and no more than 3 drops. 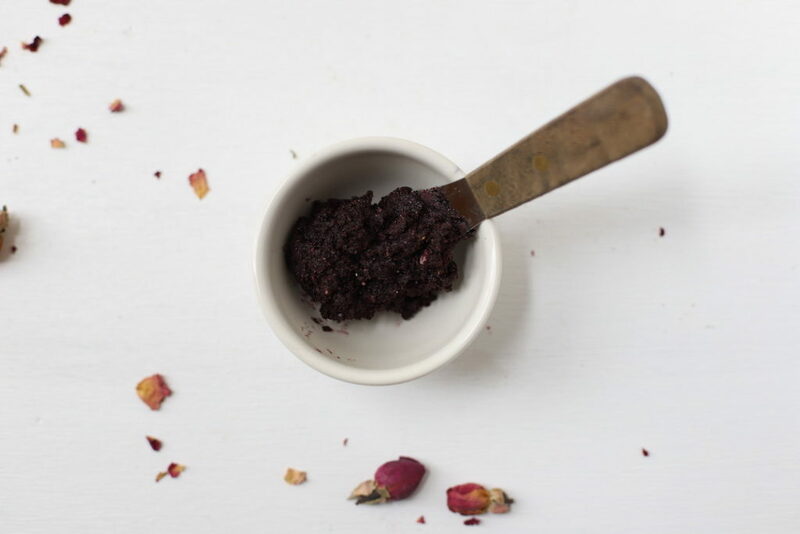 Rose Petal Powder – Take organic dried rose petals and using a clean coffee grinder for spices, process them until a powder forms. Make sure your grinder is clean (no chilies etc). Or you can be a badass and grind your own powder in a mortar and with a pestle. This post contains affiliate links. Thanks! 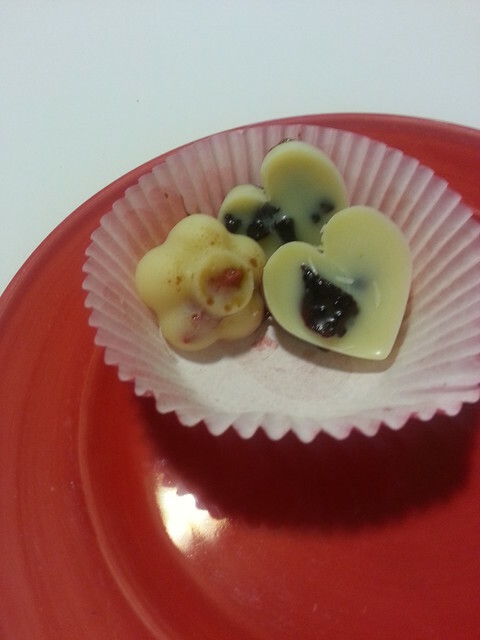 I delayed this post because of White Chocolate Failure! Have you ever wanted to make something for a holiday and taken the time to make it ahead of time so you could post it on your blog? “Do you want something exotic to try for Valentine’s Day? Imagine going to the tropics with your sweetie and…. you find some yummy dragonfruit! 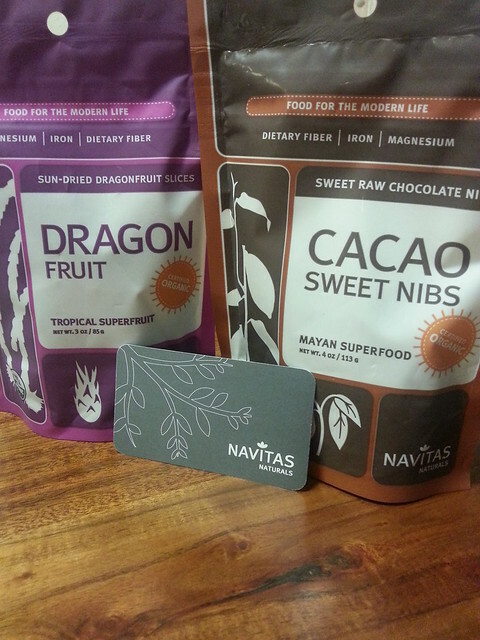 Navitas Naturals recently sent me some samples to try. I was excited to try their dehydrated dragonfruit. Fresh dragonfruit is so beautiful! It is actually a cactus fruit like the ones we find here in Texas. The taste is very similar except you don’t have to remove any of the tiny hairs, like Texas cactus fruit. I’ve seen 2 varieties – white and magenta fleshed. You can even use the outer leathery case as bowl for the moist and juicy inner fruit. The black seeds are edible and remind me a lot of black sesame seeds you might find in some Asian sweets. According the the nutrition label on the Navitas Naturals bag, the dried dragonfruit is a good source of iron. For a 1 ounce serving, you get 10% of needed iron a day. It is also very high in magnesium. If you are a foodie and follow beautiful food photography, you know Todd and Diane of White on Rice Couple. They grow the dragonfruit themselves. Another one of my favorite places on the web to see beautiful dragonfruit photos is Serene’s Eat Your Rainbows. Check out her Instagram feed with lots of colorful, vegan meals and her wonderful use of dragonfruit to add color. So what did I make with my dragon fruit? I wanted to highlight its beautiful hue and chewy texture. Unfortunately the recipe I tried was an epic failure! Do not try the recipe below. It wasted perfectly good CACAO BUTTER! The image used was not the chocolate they made…it is a stock photography photo. Also notice that comments have been closed on the post. Could it be that people had such horrible failures? 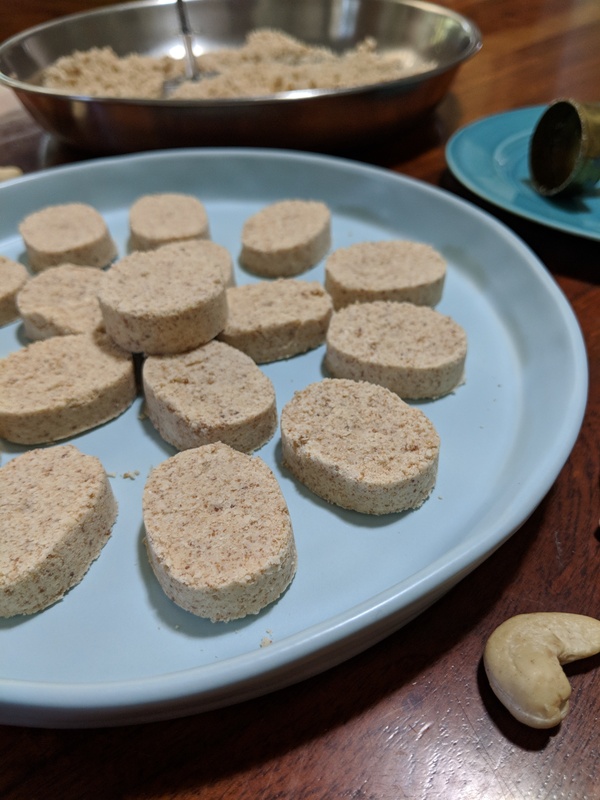 I think the main problem was that coconut sugar mixed with vanilla extract does not dissolve in cacao butter and there is no added emulsifier to get it to blend. Here are my sad little hearts and flowers. They have a gooey coconut sugar bottom and a tasteless fatty top. 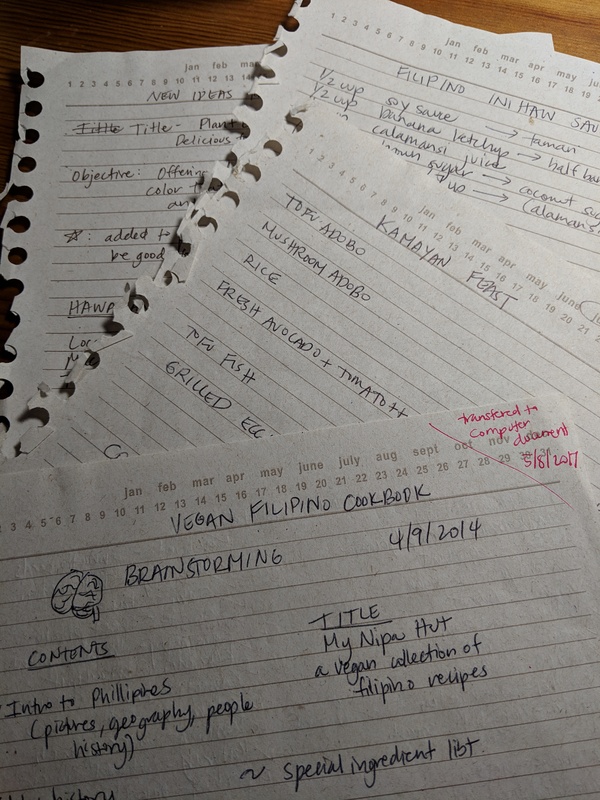 So because I was busy and also jaded, I had no time to research another recipe and buy more cacao butter, until last week. Here is attempt part 2! It’s a combination of a few different recipes I saw online that use some kind of nuts in addition to the cacao butter. I think the nuts help with emulsification and keep the sugar from separating. I ground the mac nuts in my spice grinder until it was mac nut butter. I also used stevia powder instead of any sugar. I was afraid the maple sugar would not dissolve. I also used Madagascar Vanilla powder instead of vanilla extract. I would say it turned out nicely but I am still going to tweek the recipe a bit. The dragonfruit and goji berries look beautiful against the creamy white background and give lots of antioxidants in the fatty substrate. 🙂 Luckily my V-day roses lasted long enough to make it into the picture. Anyway, it’s another lesson to me that it’s better to find recipes from real blogs instead of blog aggregate sites. I’m always going to look in the comments to see what problems other people have and find substitutions that work. Like anything, don’t make assumptions!